Needing a Tone Control, this module can be inserted in the chain between the Control Center and the Power Amplifier. The circuit is based on an original design of Reg Williamson, published on Electronics World + Wireless World, Circuit Ideas, January 1991. 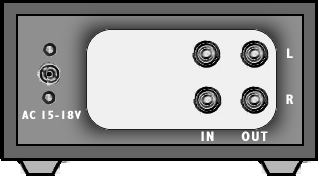 This tone control circuit will take the form of either the traditional bass and treble adjustment or the shelving type, which is similar to a "tilt" control but with independent bass and treble. Asymptotic slopes for both are about 4dB/octave, but begin to flatten out at 100Hz and 10kHz, reaching a maximum of ±15dB at the ends of the audio band. Component values in parenthesis are those for the shelving type of control. In this case, the shelf begins at about 250Hz and 4kHz, flattening to a ±6dB maximum an octave above or below; the central point is 1kHz. Reactive elements for the low end include a generalized impedance converter, which simulates an inductor in series with a resistor (gyrator). When set to the electrical centers of their respective controls, the reactive elements of the equalizers are virtually out of circuit. 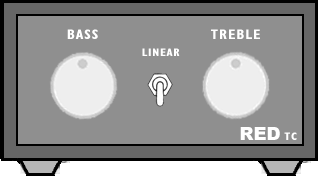 With these settings, the circuit behaves as a unity gain amplifier with 100% negative feedback. Even so, reactive elements can be switched out altogether with a DPST on/off switch. Some parts are in common to both channels and must not be doubled. These parts are: P1 and P2 (if twin concentric-spindle dual gang potentiometers are used), IC2, IC3, C4, C5, C6, C7, C8, C9, D1, D2 and J3.